Do you want your child to LOVE science? Well, so do we! At The Tiny Scientist we know exactly what it’s like to want to explore bugs, build rockets and ask millions of questions - all at the same time! Our mission is to bring out the inner scientist inherent in every child. During our hands-on AND minds-on classes, children will develop an understanding of scientific principles, build vocabulary, work together with other scientists and engage in scientific discussion. Your tiny scientists will laugh, learn, question, explore, get messy and foster a lifelong love of learning by experiencing first-hand that science is FUN! Julie G: Founder/Main Brain After almost a decade of teaching science in NYC schools, Julie realized that she needed more creative freedom to help children appreciate the world around them - and the space to make MUCH bigger messes! Julie has daydreams of being called up for the next NASA mission and works on a Horticulture Certification at the BBG when she finds time. A Brooklyn native and mother of two young scientists, Julie G. is a licensed, state certified teacher with a B.S in Biology, a B.A. in Education and an MA in Math and Science Elementary Education. Julie has current infant, child and adult CPR, AED & First Aid certification. Professor Rick: Residency Coordinator/Head Scientist Rick loves to sing and can often be heard miles from any classroom where he is working. After years of dedicated instruction in the classroom, we have stolen Rick away to pursue his passion: creating meaningful experiences for children while having as much fun as possible! He is immensely excited to be part of the Tiny Scientist team and to establish a future generation of lifelong science lovers. Rick is a licensed, state certified elementary school teacher with an MA in The Art of Teaching. One of the highlights of his teaching career was working on Earth Science with students in Connecticut. Rick has current infant, child and adult CPR, AED & First Aid certification. Professor Stephanie: Curriculum Developer Stephanie discovered her love of science in college, when instead of teaching from a textbook, her professors guided scientific discovery through hands-on experience. Following this model, Stephanie set out to start her career as a science educator. 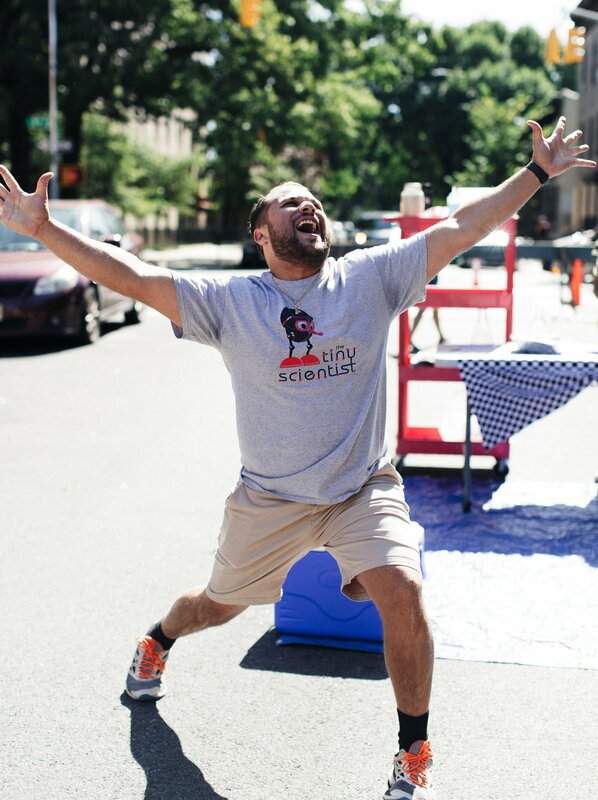 After several years of teaching in the classroom, Stephanie has joined the Tiny Scientist to spread science knowledge and excitement to a wider audience of young Brooklynites. Now, she uses her enthusiasm for the scientific process of inquiry and discovery to present complex scientific concepts in exciting, meaningful, and approachable ways to the youngest, most curious minds. Stephanie has earned a BA in Biology and Photography as well as a Masters in Elementary Education and Special Education. Stephanie has current infant, child, and adult CPR certification. Mr. Bigs and his family are known as Madagascar Hissing Cockroaches. In the wild they tend to live in the forest and other moist tropical regions. Living with us at The Tiny Scientist you will see them huddled seeking heat and dark places on these cold winter months. Males are distinguishable from females due to the large bumps, or 'horns' behind their head. They also have fuzzy antennae and spiky legs. The majority of their diet consists of rotting fruit, cat food, and meat. Pet peeves: Exoskeleton falling off in odd places and that one kid that always taps the glass.